DVBlog has had a couple of great posts that caught my eye in the last week. If you enjoyed my recent post on the history of the amen break beat (also via DVblog) you'll certainly enjoy this clip from BENT 2004. It's a good introduction to the musical world of circuit bending and a great reminder to everyone who's going to be in New York on April 19-23 to swing by and check out the Third International Circuit Bending Festival, aka BENT 2006 (bentfestival.org). BENT (2004, 8.43MB, 5 min. ) 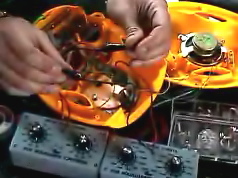 This short documentary explains what circuit bending is and why you want to attend BENT 2006 , the Third International Circuit Bending Festival , April 19-23, in NYC.